The SquawkBox service will close on 31 December 2006 after 4 years of service. At this point the service will go offline and any comments stored on the service will be removed. What to do next? If you are a SBx subscriber with a subscription, please cancel your subscription with PayPal. Subscribers whose subscriptions run beyond 31 December will be offered a refund on the unused portion of their subscription at 31 December - to apply, please cancel your subscription on PayPal and forward the cancellation email to info@squawkbox.tv. SquawkBox Pro subscribers may backup their comments using the control panel at any time prior to service shutdown. 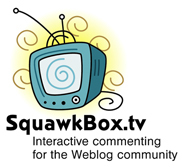 SquawkBox is an interactive commenting application for the Weblog community. We provide a way of adding commenting to your existing weblogs. Thousands of bloggers in over 100 countries already use SquawkBox for commenting - it's fast, reliable and free. If you have a weblog with Blogger/Blog*Spot, Scribble, Greymatter, Big Blog Tool, Pitas, Wanadoo Blogs, Rediff.com, Movable Type, SkyNet or Radio Userland you can add SquawkBox commenting in a matter of minutes! And once you're signed-up you can devise your own commenting templates, or just select one from our library. Either way, you have complete control over the appearance of your comments! Just follow our signup wizard and within 2 minutes you'll have a fully-featured, powerful commenting system tailored to your weblog! Login into your account here [Pro login].